This past weekend took us to Summit County to visit some family and family friends. Dave’s parents got a condo in Breckenridge so we decided it’d be a nice mini-vacation to go stay with them for a night. But since the snow conditions haven’t been that great, we decided not to spend the money on lift tickets at Breck and do something a little more adventurous – like ski a 14er. 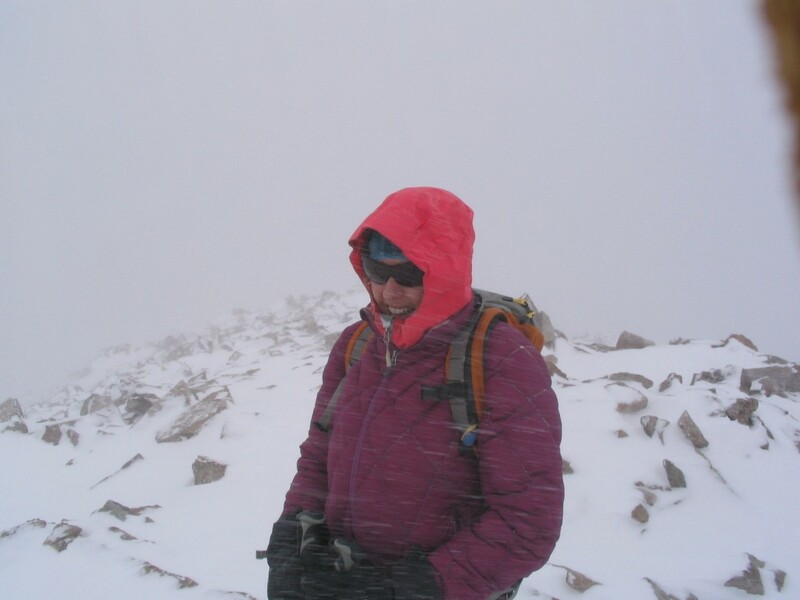 Quandary Peak is one of the easiest 14ers – both in the summer and winter – and considered a ‘starter’ winter 14er. With Dawson’s Guide to Colorado’s Fourteeners and the current avy report in hand, we set out our plan the night before. Forecast overnight called for a few inches of snow, so we kept our fingers crossed the avalanche forecast would stay at LOW. Friends had skied the Cristo Couloir last spring with a great report, and we set that as our goal, condition and weather-permitting. View of the peak from the trailhead. The Cristo is the furthest left, and looks like it should have been an easy find from the top! Saturday morning we awoke with overcast skies, no new snow, and threatening clouds to the South. After taking our time with bacon and donuts seeing what the weather would do, the sun started peaking out and the low clouds burned off – time to go! We quickly loaded the car, said by to the family (never quick) and hit the road for the 20 minute drive to the trailhead. 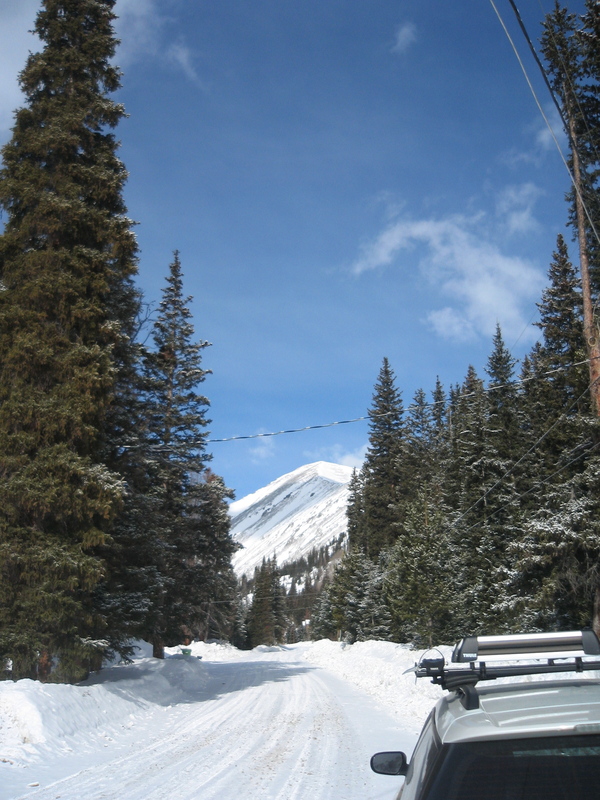 The Monte Cristo Trailhead starts at nice high 10,900 ft elevation and Quandary peaks out at 14,265. We used the East Ridge route, which is about 6 miles and a 3,365 elevation gain. The sun stayed with us for the first few miles and we stopped and chatted with people we met along the way. At about 13,500 ft, the clouds started rolling in and the wind picked up. After a short boot pack through a rock field, we added some layers, took a quick snack and leg break, put our skis back on and continued our final push to the top realizing unless the couloir was easily visible, we would probably have to descend our accent route. Yup, exactly what happened. When we peaked at about 1 pm, the wind was ripping up all sides of the peak and visibility was low – and no sign of a couloir in sight. Fearing frostbite, we descended down the ridge for a little more protection before taking off our skins and clicking in for a bit of skiing. My summit shot. I could barely get a smile out it was so cold. On the upside, the amount of wind had loaded the slope with a few inches of ‘new’ snow for some surprisingly soft turns. Not wanting to ski the skin track out, we poked through some trees and made our way back down to the car. “Happy 30th” says Dave… Skiing a 14er wasn’t a “before 30” goal, but getting one done when I had six days left until 30 felt pretty good!